Thailand is much loved across the world for its historic temples and palaces, its vibrant culture, its amazing food and, of course, its beautiful islands and beaches. But Thailand is much more than a great tourist destination. The Thailand English Teaching Programme (TET) offers you a unique opportunity to immerse yourself in the real Thailand, work in a Thai school as an English Teaching Assistant and become an integral part of life in a Thai town or village. Over 500 students from more than 40 UK universities have taken part in the programme so far, and this is your chance to join them. What is Thailand English Teaching (TET)? Since 2012, the British Council and Thailand’s Ministry of Education have been working with UK universities to bring students and recent graduates to Thailand. As an English Teaching Assistant, you will support the teaching and learning of English in Thai schools at either primary or secondary level. There are two basic types of placements open: summer placements and one-term placements. Summer term placements last for nine weeks between June and August, and are open to students and recent graduates of any course of degree. One-term placements last for four months between November to February. These are only open to students and recent graduates from Education or English teaching courses or who have some prior experience in teaching English overseas or in the UK to students of English as a foreign or second language. As an English teaching assistant you’ll be required to help teach children for up to fifteen hours a week, Monday to Friday. This might not sound like much, but you’ll need to use plenty of your spare time to plan out lessons and get involved in other school activities. Most of our previous students found themselves pretty busy five days a week. 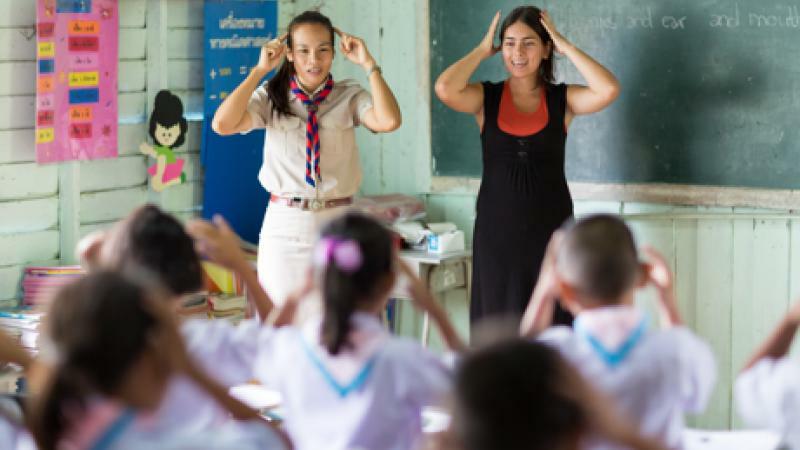 The majority of lessons will be working with the Thai teacher, assisting their lessons and helping them to develop their own English language skills. They can learn almost as much as you! But your knowledge and understanding of UK culture will also be a great benefit, giving students an idea of what life’s like in the UK. Thailand’s a big country, with a big population – about 66 million give or take a few. With so many schools it’s not possible to give choices, but we are sometimes able to try to accommodate any rough geographical preferences. No – hardly any applicants have any existing knowledge of Thai before they’re selected, but you’ll soon be taking an avid interest. You’ll also be given various briefings and orientation programmes – both in the UK and Thailand – before you start teaching. a monthly allowance for daily living costs – 10,000 Thai Baht per month (about £200 at the time of writing). The main application criterion depends on whether you’re studying Education/English teaching or something completely different. The one-term/ four-month placements are only available to students and recent graduates of Education or Teaching English or who have some prior experience in teaching English. The 9 week placements are open to students or graduates of any university subject. This will obviously change from person to person. While there are similarities in the stories we hear from students who have been, everyone has their own unique experience. Of course, you’ll get the full sensory experience of Thailand’s renowned hospitality, and get to know its people and diverse culture. But many of our students come back with a new confidence and belief in themselves – something that can only come from facing up to the challenge of living and working in a new environment on the other side of the world. No mention of hookers, cheap booze, balcony diving courses or Somchai rapists. In addition to returning with the confidence of having survived in a third world country, you could also go home, shattered, penniless and disillusioned. Having said all that, they should probably get a couple of weeks free at either end for acclimatisation and recharge the batteries. Plus a government health warning about Punty. There's an actual teacher training project taking place in a number of cities across Thailand at the moment with trainers from the BC working with local primary school teachers. I'm guessing this teaching assistant ad will be linked to the project. The project is likely to be extended over the coming years from what I hear. 72k a month outside Bangkok and 80+ in Bkk, so the money's ok too. Last edited by hallelujah; 29-06-2017 at 07:10 AM.